· And they also like the possibility that, like Matt Larson, a paleontologist for the Black Hills Institute of Geologic Research, they too might be able to someday discover dinosaur fossils – as he did just this summer in the plains of northeast Wyoming! It’s time for you and your kids to join in the prehistoric fun with Dino Dan, the award-winning live-action, CGI adventure series airing nightly on Nick Junior at 5p.m. (ET), which stars 18 true-to-life, photo-real dinosaurs alongside Jason Spevack (Fever Pitch; Sunshine Cleaning) as Dan “Dino Dan” Henderson. 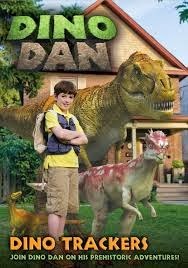 Available on DVD from NCircle Entertainment,Dino Dan, was created by Sinking Ship Entertainment. As Dino Dan comes up with a dino question or experiment to test his theories, he’s also teaching kids about science. If his first theory proves false, Dan comes up with a partial answer or discovers new information to help him resolve the question. Then Dan discovers a new way of tackling the experiment and the problem is resolved. And since the dinos inDino Dan don't speak, high-five, or use deductive reasoning, Dan and his pals work with the dinos' instincts as part of their scientific method for proving theories. Dino Dan DVDs are now available in a special 4-pack through NCircle Entertainment beginning September 24, 2013. With a suggested retail price of $24.99 for four DVDs – Ready, Set, DINO! ; Dino Trackers; To Catch a Dino! and Cretaceous Creatures! – the Dino Dan 4-pack also includes a bonus augmented reality feature on the DVD package that, when the code is scanned, brings dinosaurs to life! The four-pack is available at Target stores nationwide from September 24. To celebrate, NCircle Entertainment has provided a Dino Dan DVD 4-pack for one lucky ABCD Diaries reader! And the fun doesn’t stop there! Fans of Dino Dan can visit the dedicated Dino Dan website at http://dinodan.com/ to enjoy a number of fun and engaging online games including an interactive Dig Site, fun Dino Facts, information aboutDino Dan’s friends and even download Dino Dan apps. Dino Dan fans can also visit the Dino Dan Facebook page athttps://www.facebook.com/dinodantv. Nick Jr. also has a Dino Dan website, http://www.nickjr.com/dino-dan/, offering everything to entertain your budding paleontologists, including downloadable prehistoric printables for coloring to engaging dinosaur games and crafty Cretaceous creations including instructions for creating your own dino 3D mobile, a Dino Dan's dinosaur nest and even Dino Dan binoculars. The Nick Jr. site also has recipes for fun Mesozoic Meals like giant dinosaur track cookies and there’s even a dinosaur Fun Facts for Parents which includes a pronunciation guide for dinosaur names like Euoplocephalus!" What we thought: As huge fans of the show, the kiddos LOVED the Dino Dan DVDs!! It's so awesome to have all the best Dino Dan episodes readily available on DVD. These shows are fun and educational and really get the kiddos engaged and learning! These DVDs would make great gifts for the dino lover in your family:) ABCD Diaries gives Dino Dan DVDs an A+!